Myles Turner led the Pacers in scoring with 15 points. INDIANAPOLIS — Gordon Hayward executed the game plan perfectly for Boston on Friday night. Celtics: Kyrie Irving had 17 points and six assists, while Al Horford, Aron Baynes and Marcus Morris each scored 11 points. … Baynes also had 11 rebounds. Tatum and Horford each had seven rebounds. … The Celtics won despite playing without Jaylen Brown (back spasms). … Boston shot 52.2% from the field. Pacers: Matthews scored 10 points after missing the previous two games with a strained right hamstring. … Doug McDermott and Aaron Holiday each finished with 11 points. … Indiana was 10 of 23 on 3s and shot 41.3% from the field. 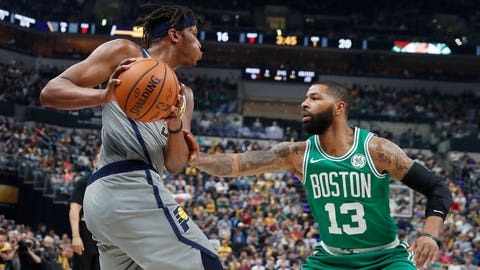 … The Pacers suffered their worst road loss of the season at Boston and their third-worst home loss this season to Boston. … Point guard Darren Collison missed his third straight game with an injured groin.